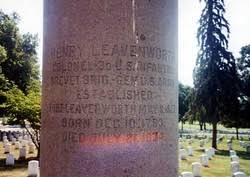 Where is General Henry Leavenworth Buried? Not only did the U.S. Indian Removal Act (IRA) of 1830 lead to the destruction of native societies in the southeastern U.S., the IRA also caused friction between the Plains Indians and the transplanted southeastern tribes. * General Henry Leavenworth established Cantonment Leavenworth in 1827 twenty-five miles northwest of present-day Kansas City, Missouri, on the west bank of the Missouri River. The army renamed it Fort Leavenworth in 1832, and it remains the oldest active U.S. Army base west of the Mississippi River. In 1832 and 1833, the U.S. sent unsuccessful expeditions into the Plains Indian's territories to try to negotiate respect for and peace with the eastern tribes. By 1834, the two Indian factions had been warring for several months. The U.S. Army assigned Brigadier General Henry Leavenworth, commander of the Southwestern Military Department, and Colonel Henry Dodge** of the First Dragoon Regiment, to meet with the Plains Nations to ask for respect for the southeastern tribes and white traders moving into their territories. The Dodge-Leavenworth Expedition included Lieutenant Colonel Stephen W. Kearny, First Lieutenant Jefferson Davis, their troops, 30 Cherokee, Delaware, Osage, and Seneca warriors, two Plains Indian women captured by the Osage tribe, George Catlin, the western artist, and other civilians. The expedition left Fort Gibson near present-day Muskogee, Oklahoma, June 15, 1834. Several accounts report that malarial fever afflicted whites and Indians at Cantonment Leavenworth and surrounding areas, and later in the 1830s, a cholera epidemic broke out. This sickness did not spare the Dodge-Leavenworth Expedition. The soldiers established hospital wagons at Camp Leavenworth. Gen. Leavenworth suffered from a high fever, remained at the camp, and ordered Dodge to continue on. Col. Dodge failed at negotiations with the Comanches because their chief was not present in the village. He moved west towards a Wichita village but had to leave soldiers at another sick camp along the way. Dodge traveled on with 183 men and found success at the Wichita village where they met the father of one of the women from the Osage abduction and won the release of a kidnapped white boy. Dodge failed to secure the release of a ranger who was captured in 1833. On the second day of negotiations with the Wichita, Comanche and Kiowa representatives joined them. Dodge returned a Kiowa woman at that time and invited the tribes to send representatives to Washington. Dodge sent a report to Leavenworth and headed east with more than 20 Plains Indian representatives on July 25, 1834. During Dodge’s absence and despite his severe illness, Gen. Leavenworth followed Dodge with a small contingent. Leavenworth died from the fever on July 21, 1834, while in the Cross Timbers. Why Is General Henry Leavenworth Important? Henry’s father, Jesse Leavenworth, served in the French and Indian War (1754-1763) and the American Revolution (1775-1783). Brigadier General Henry Leavenworth was born in 1783 in New Haven, Connecticut, at the height of the jubilation of the birth of the United States. We celebrate July 4th as our day of independence from England. However, July 4th, 1776 is only the day that the Declaration of Independence was adopted by the Second Continental Congress. It was not until the 1783 Treaty of Paris was signed that America became the United States of America. That treaty ended our Revolutionary War. Henry Leavenworth’s father educated him in New Delhi, New York, and he read law until 1812. The 25th U. S. Infantry commissioned Leavenworth as a captain in April of 1812, and by 1814, he emerged as a colonel in the War of I812. (3) History credits Gen. Leavenworth with a lasting impact on standards of duty and discipline of the U.S. Army. He founded the School of Practice for Infantry while commanding the Third Infantry Regiment at Jefferson Barracks, Missouri, established in 1827. The U.S. sent him west ahead of the enactment of the IRA to establish military posts in Indian Territory. At age 35, the U.S. Army promoted him to lieutenant colonel of the Fifth U.S. Infantry. Gen. Leavenworth built the first military forts that opened up the west to settlement. 1815: Appointed Indian Agent at Prairie du Chien in southwestern Wisconsin. 1819: Began construction of Fort Saint Anthony. 1820: Renamed Fort Anthony Fort Snelling at the junction of the Minnesota and Mississippi Rivers. 1823: Led troops in the Arikara War, the first U.S. attack against a Great Plains Indian Nation. 1823-1827: Established several military outposts following the Mississippi River south to Indian Territory. 1825: Became Brigadier General Leavenworth. 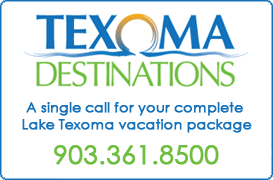 1834: Commanded the 1st United States Dragoons into the Wichita Mountains from Fort Gibson, Indian Territory. Died near present-day Kingston, Oklahoma, and was buried there for several months. *During the 1830s, President Andrew Jackson signed nearly seventy Indian removal treaties. Several of those treaties obligated the United States to provide protection for the civilized eastern Indians from the wild Indians of the Plains. **Dodge City, Kansas, is the namesake of Henry Dodge where the Longbranch Saloon is still in business and which will forever be associated with Marshal Matt Dillon and Miss Kitty of Gunsmoke. 1. 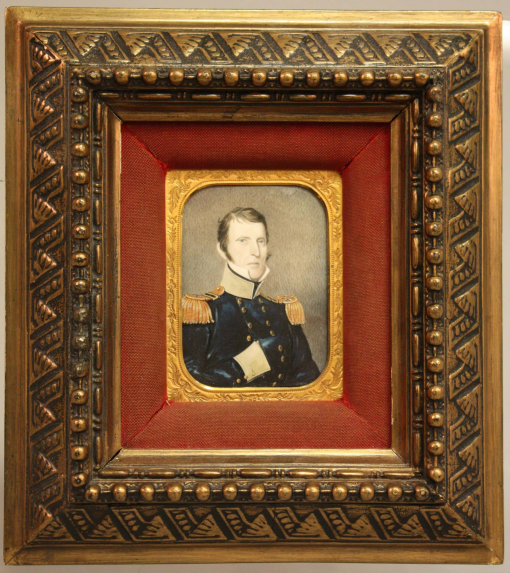 Miniature portrait of Henry Leavenworth against a gray background depicting the subject in a pattern 1832 - 1851 Brigadier General's dark blue coat with gold epaulets, buff collar, and buff cuffs. Leavenworth's hair and eyebrows are brown and eyes are grey. The portrait appears on a thin sheet of ivory which is laminated to a second sheet to add strength. Two fingerprints from glue or lacquer appear at the top. A slight line in the lower left corner appears to be a repair from a chip broken off from the portrait and mended for the donor. When given to the museum, the portrait was encased in a slightly oversized daguerreotype frame. George Catlin portrait. 2. Colonel Henry Dodge by George Catlin. 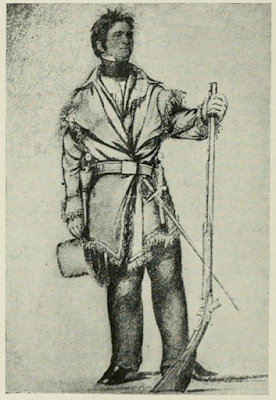 It is an excellent sketch and shows the colonel in the typical dress of this period of an active man on the frontier. 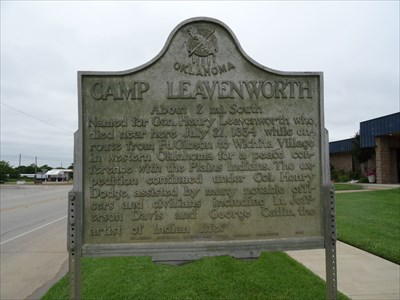 Named for Gen. Henry Leavenworth who died near here July 21, 1834, while en route from Fort Gibson to Wichita Village in western Oklahoma for a peace conference with Plains Indians. The expedition continued under Col. Henry Dodge, assisted by many notable officers and civilians including Lt. Jefferson Davis and George Catlin, the artist of Indian life.